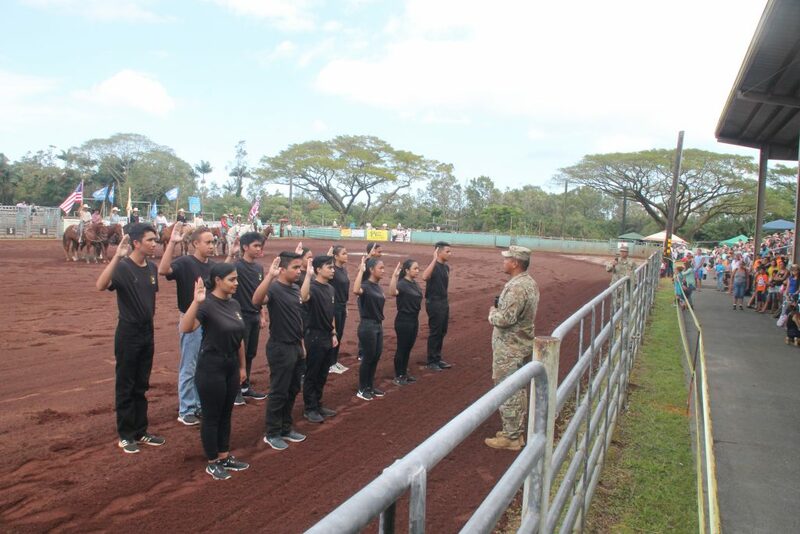 A record number of Big Island residents and visitors turned out over Presidents’ Day weekend, Feb. 16 to 18, 2019, for the 27th Annual Hawai‘i Horse Owners Pana‘ewa Stampede Rodeo at the Pana‘ewa Equestrian Center in Hilo. Over the three-day weekend, an estimated 10,000 spectators watched 185 cowboys and cowgirls from ages 3 to 73 compete in the rodeo. Approximately 4,000 people participated, volunteered or watched the rodeo events on Sunday, setting a new record. Each year, the event includes a rodeo clown, a professional announcer, a wide variety of food booths, craft booths, and leather and saddle making exhibits, as well as cultural and historical displays. This year’s event marked the 11th year National Finals Rodeo Clown JJ Harrison served as the barrel man and entertainer for the event. Justin McKee was this year’s announcer and Jason Buchanan provided sound and music for the rodeo. Keiki competed in dummy roping, mutton busting (sheep riding), roping, barrel racing, team roping and junior bull riding. 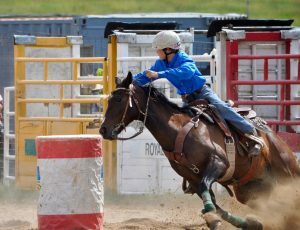 This year’s novelty events included Chute Dogging, Ranch Mugging (no horses) and “Crazy Bull Action”—Hula Bulls and Bull Poker. Hawai‘i’s paniolo heritage is a cowboy culture over two centuries old. 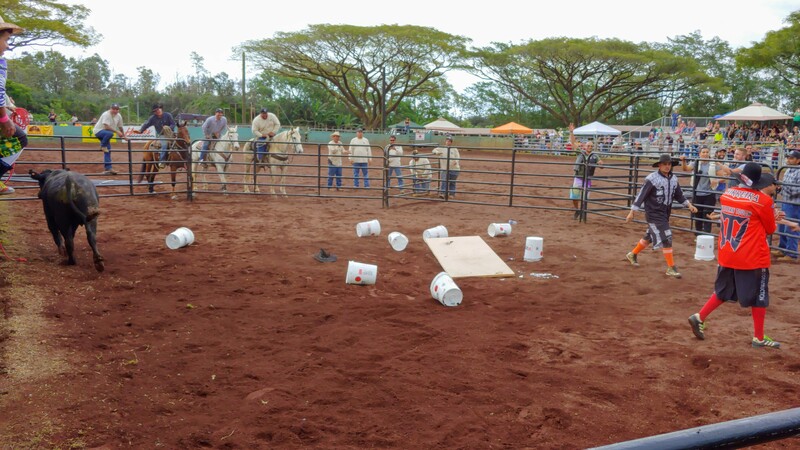 Paniolo traditions continue and are seen at the rodeo as cowboys and cowgirls compete in unique Hawai‘i events like Wahine Calf Mugging, Po‘o Wai U and Double Ribbon Mugging. In Double Ribbon Mugging, two cowboys/cowgirls work together to rope a calf, pull ribbon from it’s tail and remove their rope from the calf. The team with the fastest time wins. During Po‘o Wai U, wild cattle are lassoed and tied to an aumana, a Y-shaped tree. In the event, competitors must quickly rope the horns of a steer and tie it to the aumana with a non-choke knot. 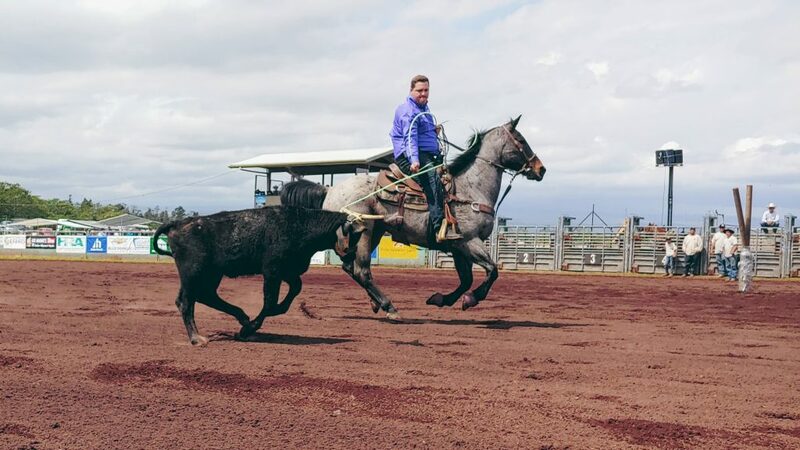 The Pana’ewa Stampede Rodeo is held each year over Presidents’ Day weekend. 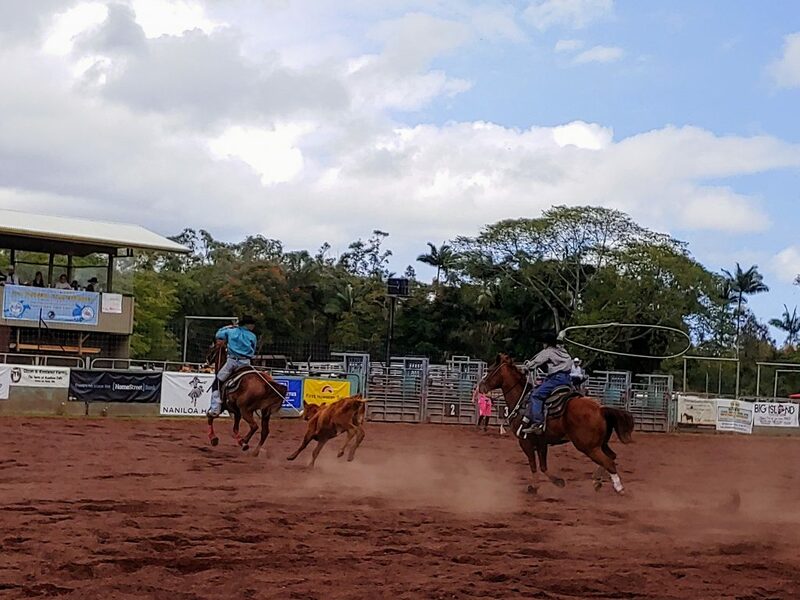 The 28th Annual Pana’ewa Stampede Rodeo will be held Feb. 15 to 17, 2020. Hilina’i Gouveia was crowned the 2019 Rodeo Queen. Kircia Derasin was crowned Rodeo Princess. 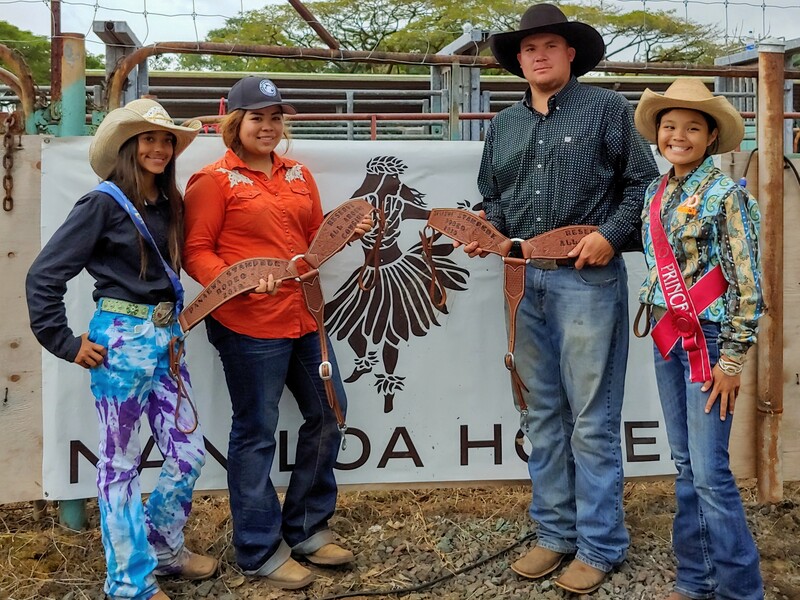 (L–R) Pana‘ewa Rodeo Queen Hilina’i Gouveia, All Around Cowboy Westin Joseph, All Around Cowgirl Lenaia Andrade and Rodeo Princess Kircia Derasin at the 27th Annual Pana‘ewa Stampede Rodeo, Feb. 18, 2019. Photo: Crystal Richard. 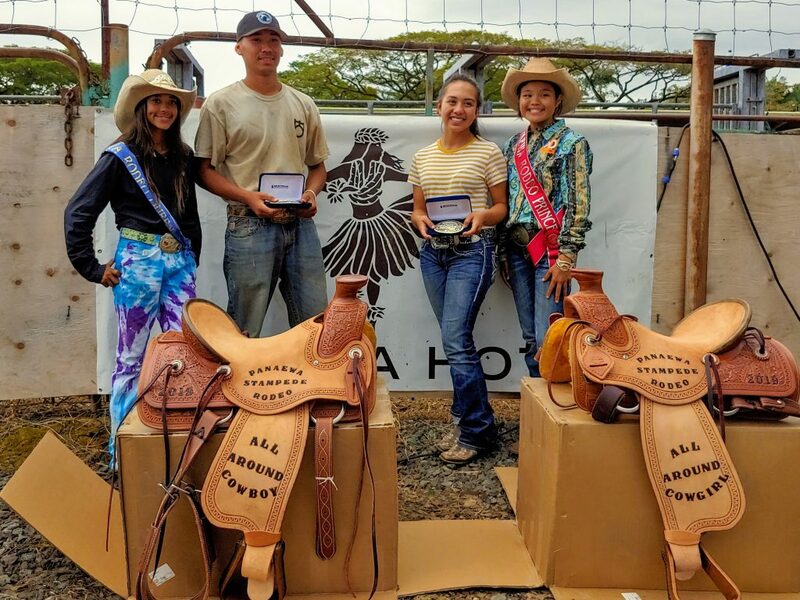 (L–R) Pana‘ewa Rodeo Queen Hilina’i Gouveia, Reserve All Around Cowboy Kaili Brenneman, Reserve All Around Cowgirl Jerikah Valencia and Rodeo Princess Kircia Derasin at the 27th Annual Pana‘ewa Stampede Rodeo, Feb. 18, 2019. PC: Crystal Richard. 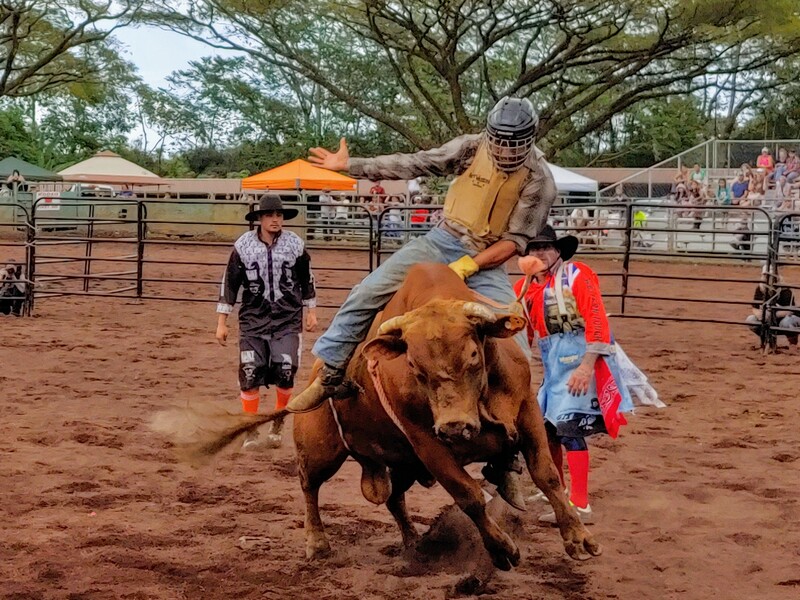 Organizers expressed a big mahalo to all the 2019 Pana’ewa Stampede Rodeo Signature Sponsors. Golden Spur Sponsors: Grand Naniloa Resort & Coors Light – Paradise Beverages. Silver Spur Sponsors: HomeStreet Bank, Edmund Olson Trust II, Day-Lum Rentals & Management and First Hawaiian Bank. Bronze Spur Sponsors: Associa, DeLuz Chevrolet Hawaii, OK Farms, Coldwell Banker, Day-Lum Properties, Hamakua Macadamia Nut Company, Hawaii Volcanic Water, Kau Coffee Mill, Law Offices of Charles M. Heaukulani, Oahu Air Conditioning Service, Black Rock Cattle, Ohana Environment Construction and Benjamin Moore. Copper Spur Sponsors: Bank of Hawaii, ENPRO Environmental, HPM Foundation, Hawaii Electric Light Company, Hawaii Radiologic Associates, HPM Building Supplies, Big Island Toyota, Pepsi, Mattos Electric & Ultimate Off Grid Solar, Pono’s Used Cars, Lex Brodie’s Hawaii Tire Company, Miranda Country Store, United States Army Recruiters and 3T Cleaning Service. The Hawaii Horse Owners, Inc. was awarded a grant from the Hawaii Tourism Authority (HTA) for the 2019 Annual Pana‘ewa Stampede. The HTA grant helps with advertising, which helps more people to understand and appreciate the significance of the Paniolo culture and history on Hawaii Island. 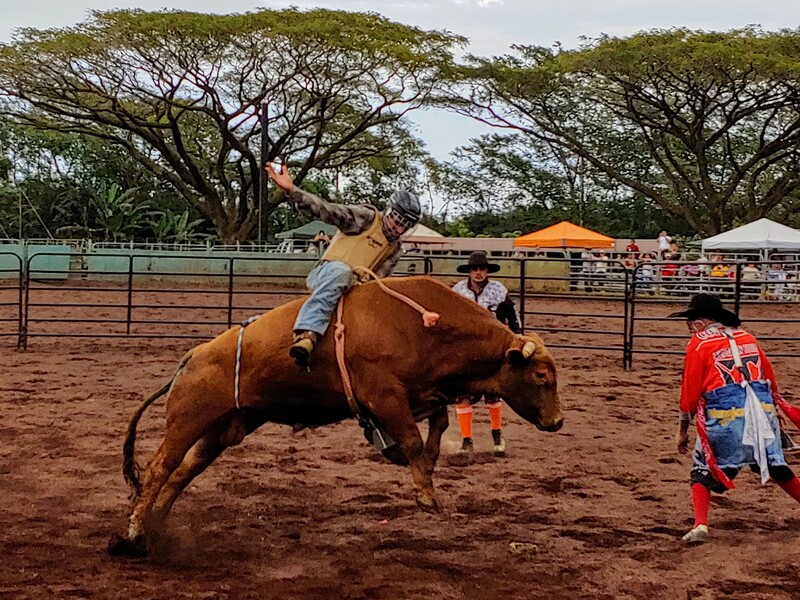 Bull riding during the 27th Annual Pana‘ewa Stampede Rodeo, Feb. 16, 2019. PC: Crystal Richard. 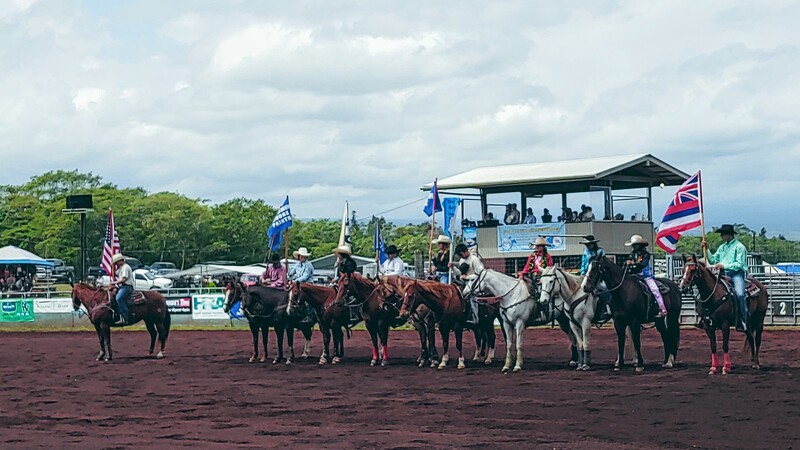 Rodeo grand entry during the 27th Annual Pana‘ewa Stampede Rodeo, Feb. 16, 2019. PC: Crystal Richard. Keiki enjoying the rodeo and a few unusual spectators at the 27th Annual Pana‘ewa Stampede Rodeo, Feb. 18, 2019. PC: Crystal Richard. 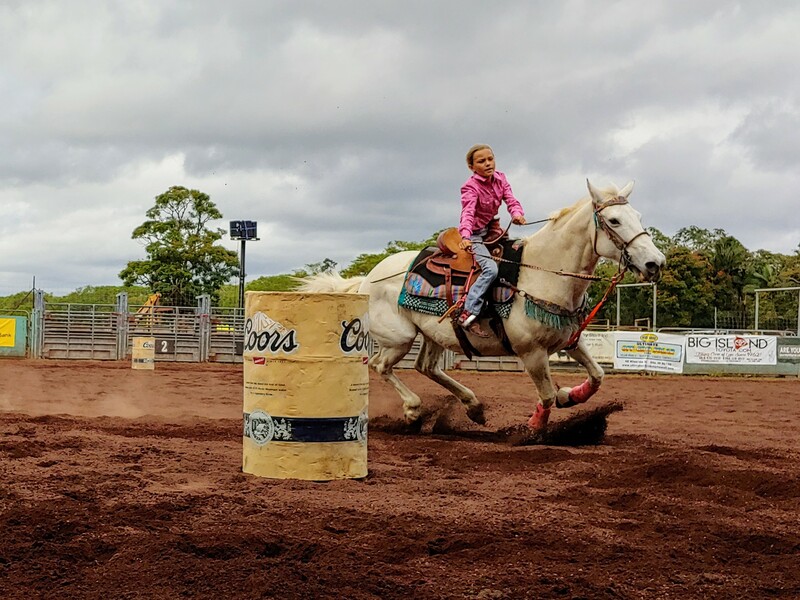 Addie Flores youth barrel racer, during the 27th Annual Pana‘ewa Rodeo in Hilo, Feb. 18, 2019. PC: Crystal Richard. 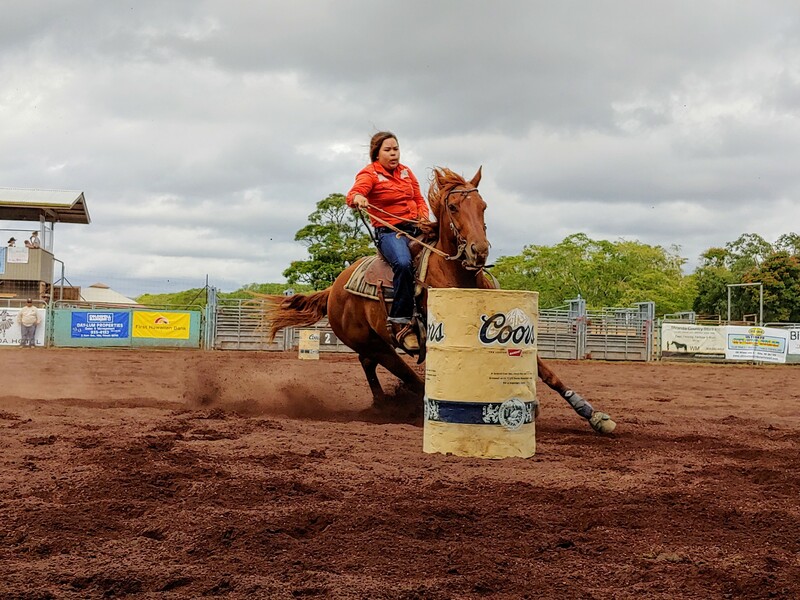 Kalysa Hamilton smoking her barrel run at the Pana‘ewa Stampede Rodeo, Feb. 18, 2019. PC: Crystal Richard. 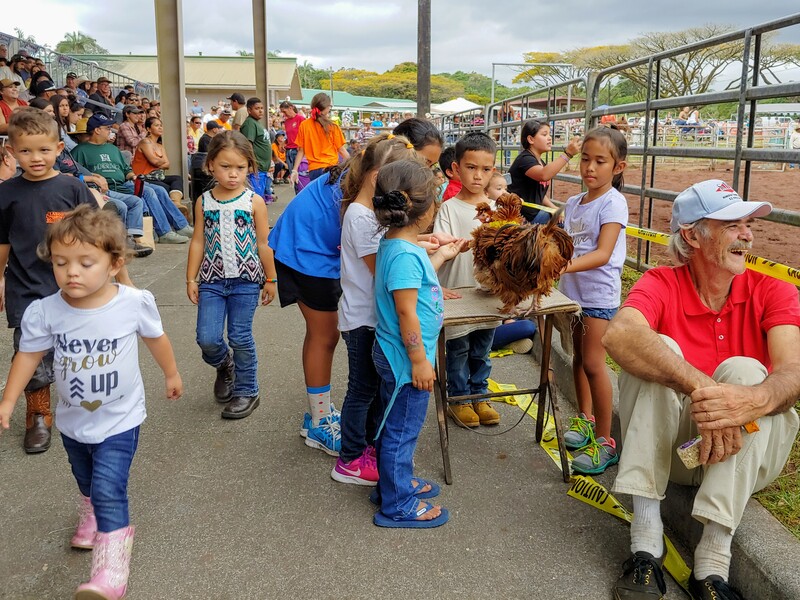 Kane-Wahine Ribbon Mugging at the 27th Annual Pana‘ewa Stampede Rodeo, Feb. 18, 2019. PC: Crystal Richard. 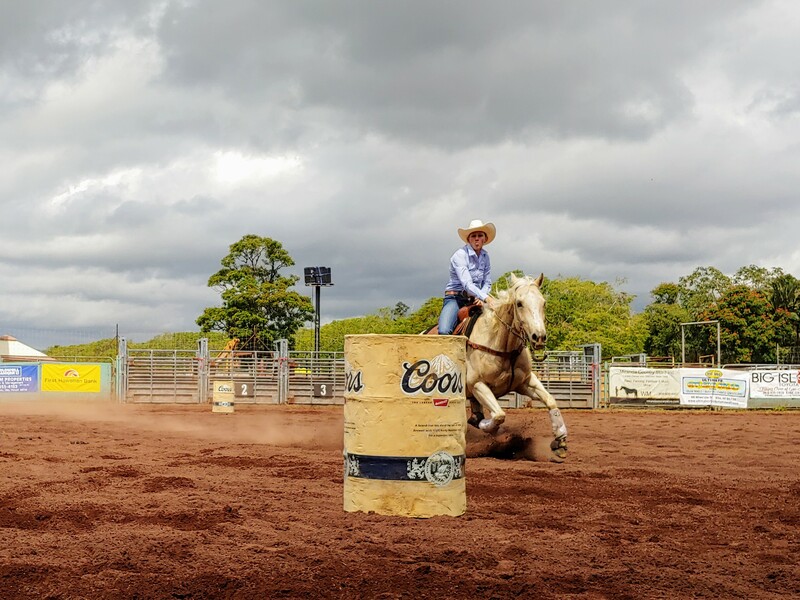 Jerikah Valencia barrel racing during the 27th Annual Pana‘ewa Stampede Rodeo, Feb. 18, 2019. PC: Crystal Richard. 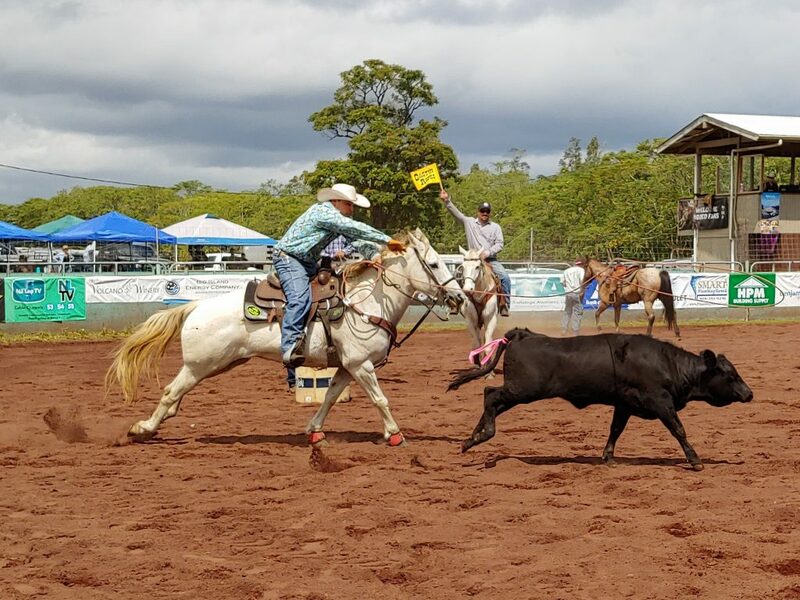 Kane-Wahine ribbon mugging competitors during the 27th Annual Pana‘ewa Stampede Rodeo, Feb. 16, 2019. PC: Crystal Richard. 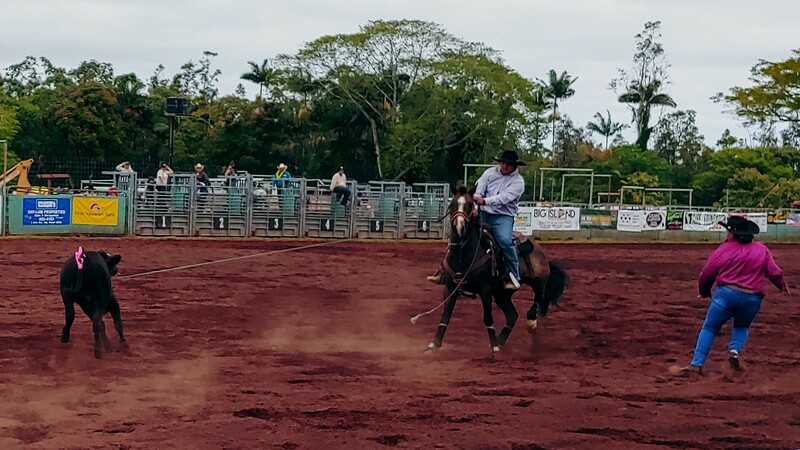 Jeremy Andrade competing in Po‘o Wai U during the 27th Annual Pana‘ewa Stampede Rodeo, Feb. 16, 2019. PC: Crystal Richard. Team roping at the 27th Annual Pana‘ewa Stampede Rodeo, Feb. 18, 2019. PC: Crystal Richard. 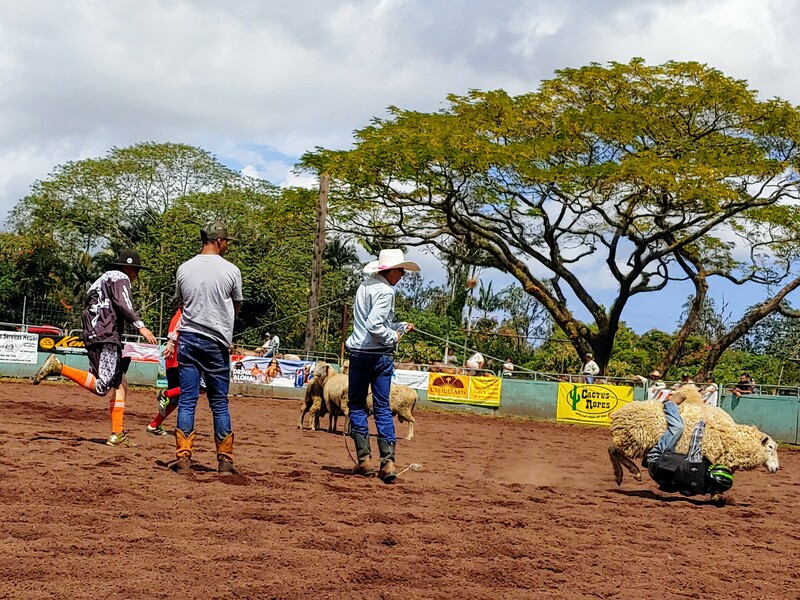 Sheep riding during the 2019 Hawai‘i Horse Owners Annual Pana‘ewa Stampede Rodeo, Feb. 17. PC: Crystal Richard. 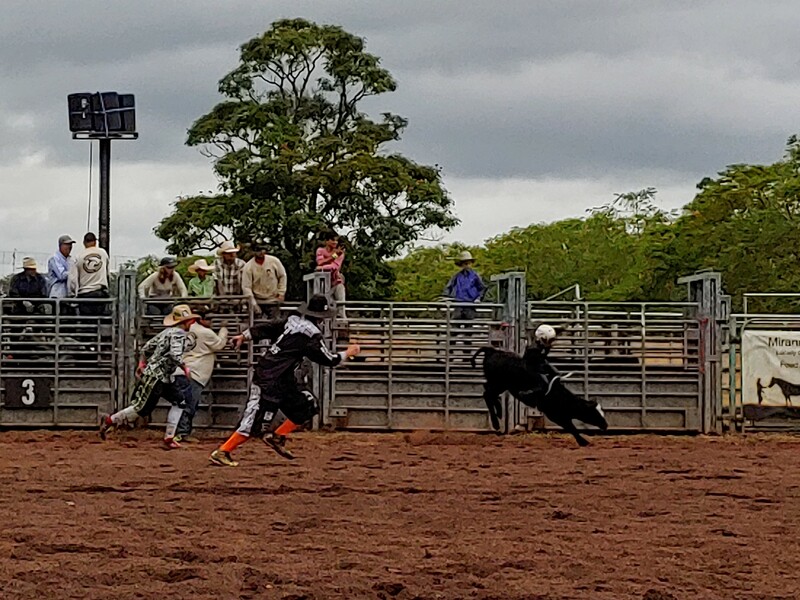 Calf riding during the 2019 Pana‘ewa Stampede Rodeo, Feb. 18, 2019. PC: Crystal Richard. 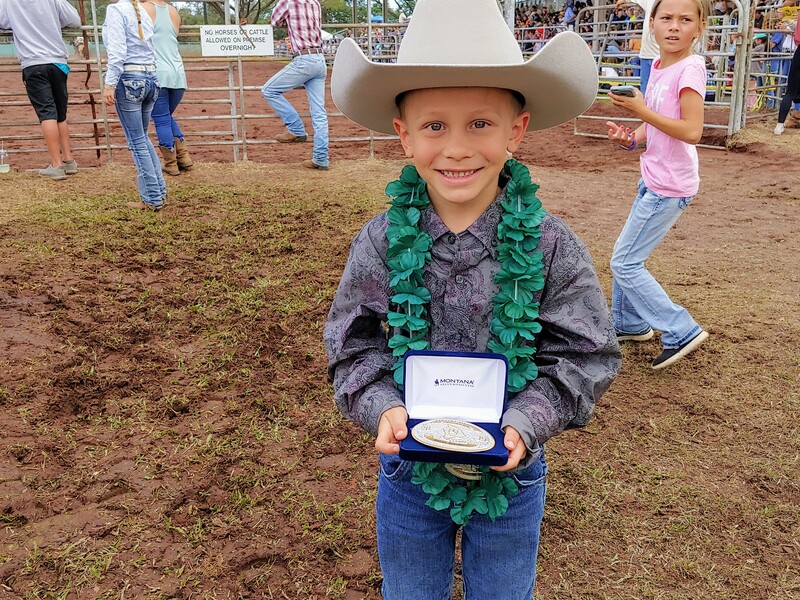 Colty Boy Mandaloniz took home the buckle for winning the sheep riding contest 27th Annual Pana‘ewa Stampede Rodeo, Feb. 18, 2019. PC: Crystal Richard. 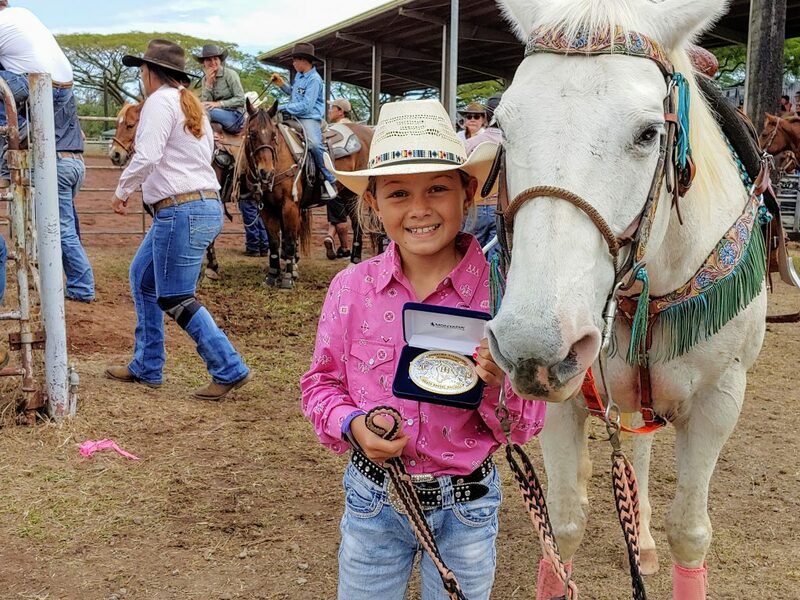 Addie Flores youth Barrel Racing champion at the 27th Annual Pana‘ewa Stampede Rodeo, Feb. 18, 2019. PC: Crystal Richard. 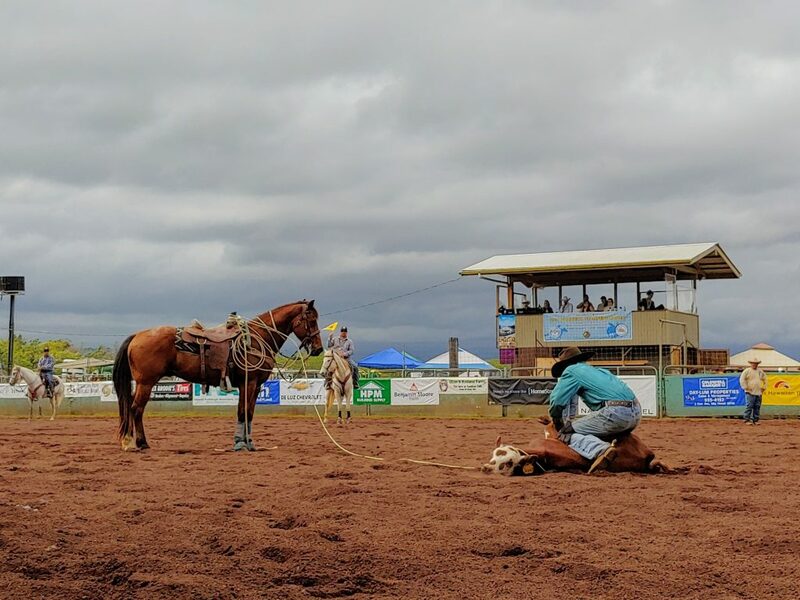 Tie Down Roping at the 2019 Pana‘ewa Stampede Rodeo, Feb. 18, 2019. PC: Crystal Richard. 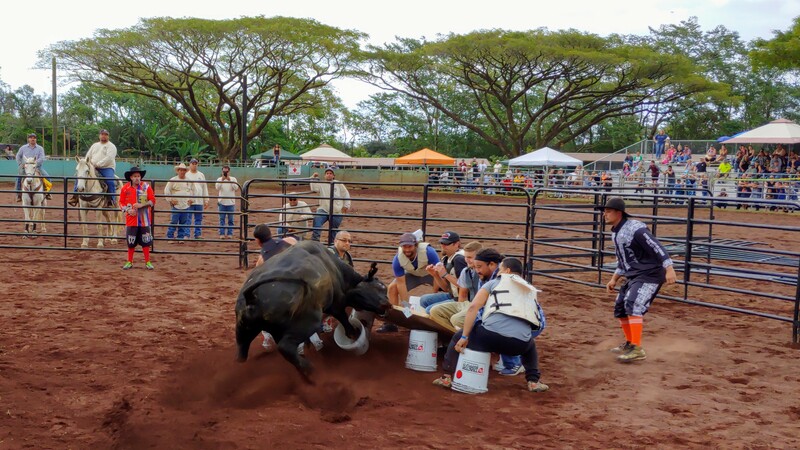 Bull Poker at the 27th Annual Pana‘ewa Rodeo in Hilo, Feb. 18, 2019. PC: Crystal Richard. 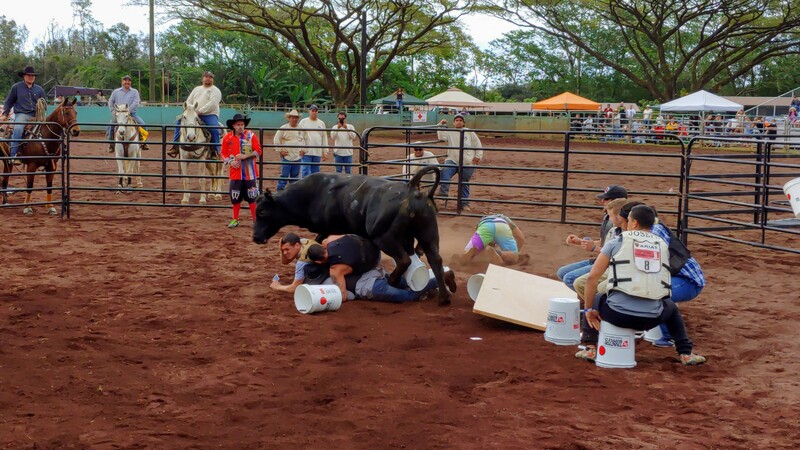 Bull Poker at the 2019 Pana‘ewa Rodeo, Feb. 18, 2019. PC: Crystal Richard. 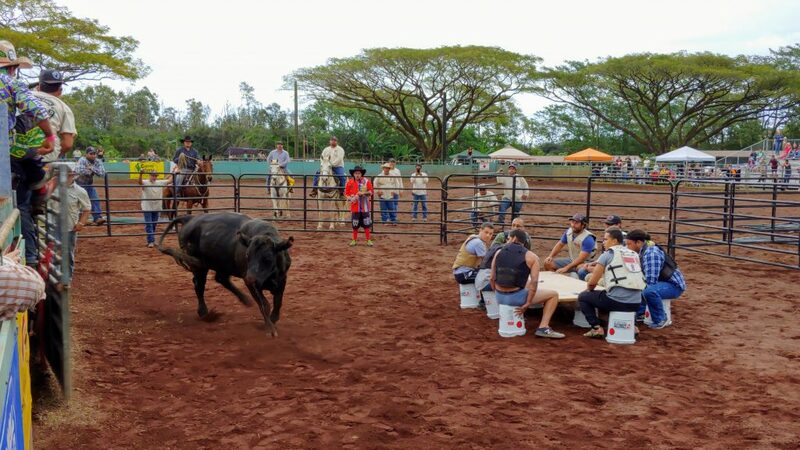 Bull Poker during the 27th Annual Pana‘ewa Stampede Rodeo, Feb. 18, 2019. PC: Crystal Richard. Crystal Richard moved to East Hawai’i in 2005 to attend UH Hilo. 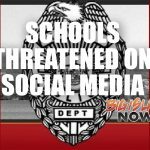 While earning her bachelor’s degree in English and a certificate to teach English as a second language, Crystal served as the editor-in-chief of “Hohonu,” UH Hilo’s academic journal, and as assistant editor-in-chief at “KeKalahea,” UH Hilo’s student newspaper. From a young age, Crystal fell in love with the written word and has always dreamed of a career in journalism. 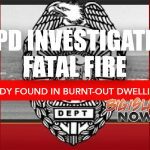 She has worked as a Big Island Now freelance reporter since September 2016. She is a wellness and health advocate who enjoys swimming, gardening, reading and spending time with her animals and loved ones.